When building a camera from scratch, an Arduino board might not be the first thing you think of. There are however, a number Arduino compatible camera units. Let’s take a look at the options available. Between 2003 and 2008, digital camera sales tripled, before smartphones turned the tide and digital cameras quickly fell from favor. It’s easy to see why with phones being targeted at users specifically on the strength of their cameras The Best Smartphone Camera: Google Pixel, Apple iPhone, OnePlus, and More The Best Smartphone Camera: Google Pixel, Apple iPhone, OnePlus, and More You can take quality photos on your smartphone, no DSLR required. But with so many options, which is the best smartphone camera? Read More . After all, it’s so much easier to only have one device to carry around. Enter the TaskCam kit. Specifically aimed at artists and the DIY electronics market, this is perfect for anyone who’d rather build their own camera. The simple but elegant TaskCam 3D-printed edition is designed to emulate the feel of a disposable camera with a few notable differences. An Arduino Uno is the brains of the operation. The TaskCam shield provides a screen to post “tasks” to the user, along with the battery holster, SD card slot, and camera unit. All of it fits neatly into a 3D-printed case or enclosure of your own devising! Intended for use in public places to snap prompt-based photos, the TaskCam is a fresh take on digital photography. Best of all? The project is open source, so you are free to download the schematics from CircuitMaker and make your own PCB. The 3D print is designed for even budget printers making it a great beginner 3D printing project. Our guide to 3D printing Ultimate Beginner's Guide to 3D Printing Ultimate Beginner's Guide to 3D Printing 3D printing was supposed to be the new "Industrial Revolution." It hasn't taken over the world yet, but I'm here to talk you through everything you need to know to get started. Read More will help you through the process! ArduCAM is an SPI module designed for use with microcontrollers. 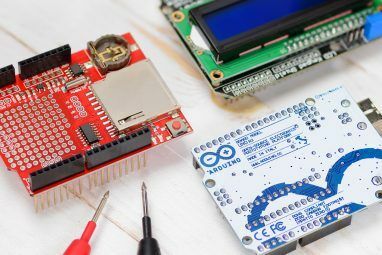 The modules run at a low enough voltage to be powered directly from Arduino pins, but provide an output resolution high enough for a variety of uses. In the project’s Instructable, dmainmon swaps out the Arduino board for the compatible but better-featured ESP8266. (We also think ESP8266 beats Arduino! Meet the Arduino Killer: ESP8266 Meet the Arduino Killer: ESP8266 What if I told you a there's an Arduino-compatible dev board with built-in Wi-Fi for less than $10? Well, there is. Read More ) This makes the camera unit wireless, and the included code supports static images, and live video streaming to the browser. This build is only one step away from being an automated surveillance system. However, savvy IFTTT users (our IFTTT guide The Ultimate IFTTT Guide: Use the Web's Most Powerful Tool Like a Pro The Ultimate IFTTT Guide: Use the Web's Most Powerful Tool Like a Pro If This Then That, also known as IFTTT is a free web-based service to get your apps and devices working together. Not sure how to build your applet? Follow along with this guide. Read More ) could use a plugin to save images periodically to Dropbox. Few things are cooler than an auto-tracking robot arm. A foam dart gun attached to an auto-tracking robot arm is one of them. Combining several parts from Trossen Robotic’s RobotGeek line, this automatic color-tracking robot desk sniper uses a Pixy camera module in conjunction with an Arduino to track its targets. The Trossen Robotics team’s guide on the Arduino Project Hub covers each element for setup of the autonomous aimbot. They also provide link to purchase all of the parts needed to build it. While there are cheaper options for a first-time Arduino robotics project 8 Arduino Robots You Can Build for Less than $125 8 Arduino Robots You Can Build for Less than $125 The Arduino can do a lot, but did you know it can create full-fledged robots? For quite cheap, too! Read More , this one wins points for being so very, very cool. While seeming similar to the ESP8266 security camera earlier in this article, the Arduino Yun motion-activated camera has a crucial difference. It attaches to the board via USB. This has several clear advantages. USB webcams are readily available, and there are many USB video class devices at the budget end of the spectrum. This makes this project perfect for anyone wanting to tinker with cameras on the Arduino platform, without buying costly parts they may never use. When the motion sensor triggers, images from the webcam are stored on the SD card of the Yun before being uploaded to the user’s Dropbox via Temboo for later viewing. The setup also allows for streaming of video directly to YouTube, making this project more than just another home security system, but a unique DIY method of streaming live. There is a caveat to this method, however. 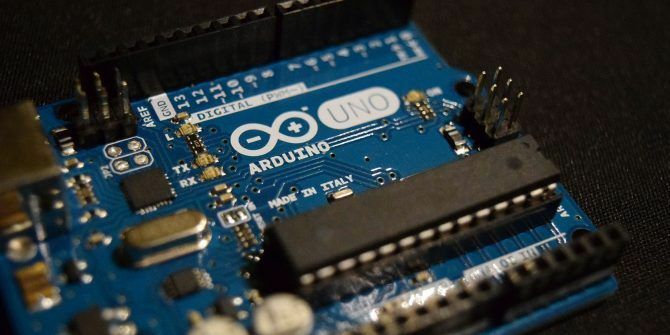 The Arduino Yun was “retired” by the Arduino project, and while the boards are still available from 3rd party vendors, they might not be easy to find. However, some clone boards which will perform a similar function, and Arduino shields such as the Dragino Yun Shield are designed to provide the same functionality as the original Arduino Yun. Having a robot to order around is one of the best feelings in the world. While it may be some time until we can casually ask our robot butler to cook us a meal, a little tinkering could get you an obedient little robot worker today! KureBas Robotics combined voice activation, a cheap action cam, and a two-wheeled robotic armed robot to make his table-cleaning Arduino bot. 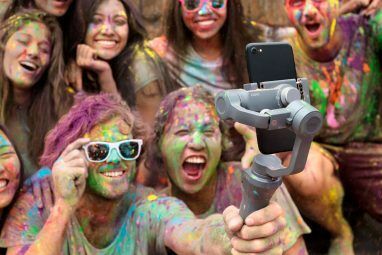 By combining the Wi-Fi function of the action camera with a Bluetooth system for controlling the robot’s movement, KureBas utilized a reusable camera rather than a costly microcontroller only unit. The remote control of the robot along with the voice activation is made possible through the Android app designed by the project builder, available for download from the tutorial page. There are many DIY camera projects 5 DIY Cameras You Can Build Today 5 DIY Cameras You Can Build Today Taking a photo is so simple these days. All you need is a smartphone, a subject, and the ability to point and shoot. But it wasn't always as easy. 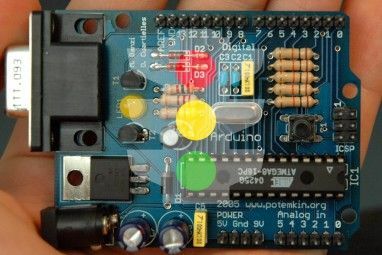 Read More which do not use an Arduino, but for fully integrated projects, the Arduino framework along with other similar microcontrollers add a new element to digital photography. Explore more about: Arduino, DIY Project Ideas, Photography.